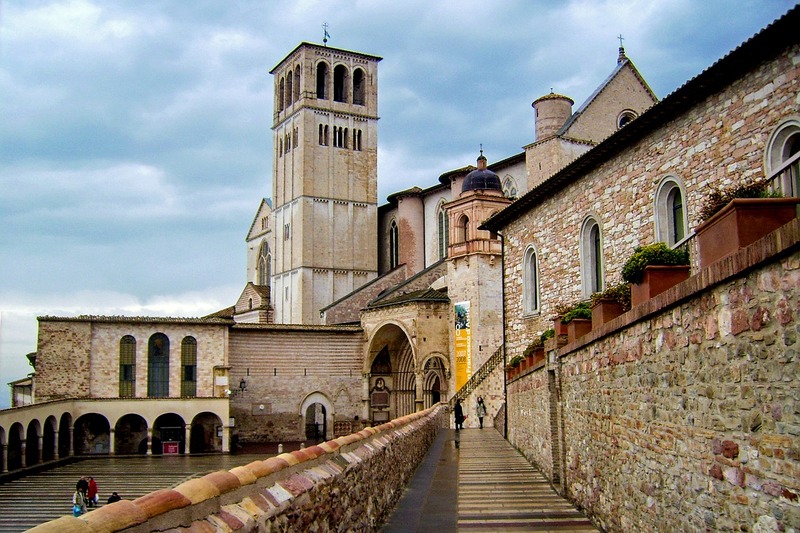 The town of Assisi will forever be associated with its most famous son, Saint Francis, the founder of the Franciscan order and patron of Italy. A town located in the Umbria region of Italy in the province of Perugia, Assisi is also the birthplace of Saint Clare and Saint Gabriel of Our Lady of Sorrows. The town’s vast collection of medieval art and famous buildings, including the great Basilica di San Francesco, has ensured its inclusion on UNESCO’s World Heritage List and makes it a must-see for travellers. Saint Francis was born to a wealthy family in Assisi and only devoted himself to a life of poverty after hearing a sermon in 1209. Saint Francis wore garments made of rough materials and often preached barefoot to the locals. It wasn’t long before Saint Francis was joined by Bernando di Quintavalle and others who contributed everything to the cause. The Franciscan brothers lived in a deserted house near Rivo Torto in Assisi, however, they spent the majority of their time travelling to the neighbouring districts and towns to preach. The Franciscans were always known to be cheerful despite the hardships they faced – singing, dancing and making a deep impact on the people around them. St. Francis of Assisi Ph. flickr/Fr Lawrence Lew, O.P. The basilica is the mother church of the Franciscan order and a very important pilgrimage site in Italy. The Saint is buried in the basilica and thousands of people from all over the world visit the famous church each year. The construction of the basilica began in 1228 and inside are two different churches, the Lower church and the Upper church. The crypt, where the remains of Saint Francis are kept, are a part of the structure and, along with the friary, it is considered to be a very important architectural landmark. The design of the basilica is attributed to brother Elia da Cortona, who was a follower of Saint Francis, however, the construction of the basilica began quite a bit after the foundation stone was officially laid. The architecture of the basilica is a mix of Gothic and Romanesque styles and features various elements typical to Gothic Italian architecture. Both the upper and lower floors have a simple cruciform plan. There is a large bell tower on the left side of the church which is Romanesque in design. The upper Basilica is quite large in size, brightly lit and has a four bay single nave with a cross vaulted ceiling. The ceiling is bordered with various patterns of leaves and crosses and there are four vaults decorated with paintings and stars. The second vault has various roundels and scenes depicting Christ facing the Virgin and Saint Francis. One of the most noteworthy aspects of this basilica is the series of frescoes located on the lower part of the nave, several of which have been attributed to Giotto. Every bay has three different frescoes on each side of the nave and there are two at the entrance. The frescoes showcase various events in the life of the Saint. It is said that the 1266 biography of the Saint was used to get an understanding about the events in his life. These frescoes are thought to have been created between 1296 and 1304 and are very vivid and beautiful. The Lower Basilica was designed also by brother Elia da Cortona, as a large vaulted crypt. The doors of this basilica are topped with huge rose windows and there are two small windows on each side, which are known to be the eyes of the church. The decorations on the wooden door on the left side of the basilica were done by Ugolinuccio da Gubbio. These decorations showcase various scenes from lives of Saint Francis, Saint Anthony, Saint Louis and Saint Clare. In this church is a single nave with different side chapels, which have been decorated with arches. The nave itself is decorated with a fresco considered the oldest in the church and was painted by Maestro di San Francesco. It shows five different scenes from the Passion of the Christ and on the opposite side equivalent scenes from the life of the Saint. 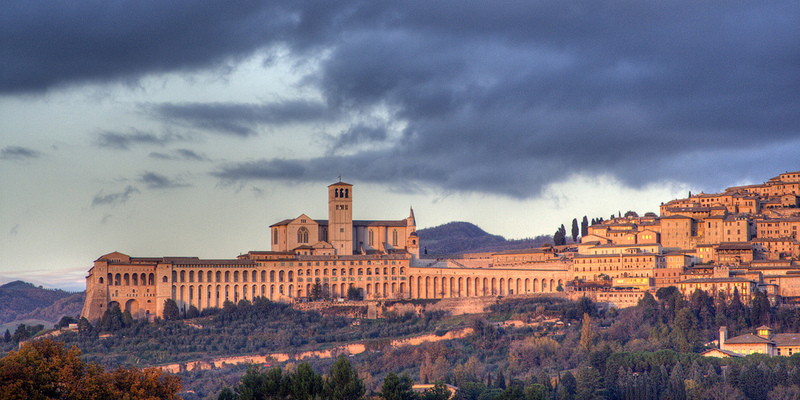 Assisi has played an important role in the growth of the Franciscan order in Italy and the Basilica of San Francesco itself is a unique masterpiece, which remains a draw for visitors the world over.